AN UNFORGETTABLE OPPORTUNITY TO STUDY ABROAD! Don't miss this chance to take Modern Dance master class with an acclaimed dancer, teacher and director of FINI Dance Festival, Antonio Fini. Students will have an opportunity to audition for the 3 week 2019 Summer Dance Intensive in Calabria, Italy! 2 FULL TUITION SCHOLARSHIPS, room and board included, to be awarded by the Dancing Angels Foundation in collaboration with FINI Dance. Antonio Fini is an Italian born modern dancer, choreographer, and director. 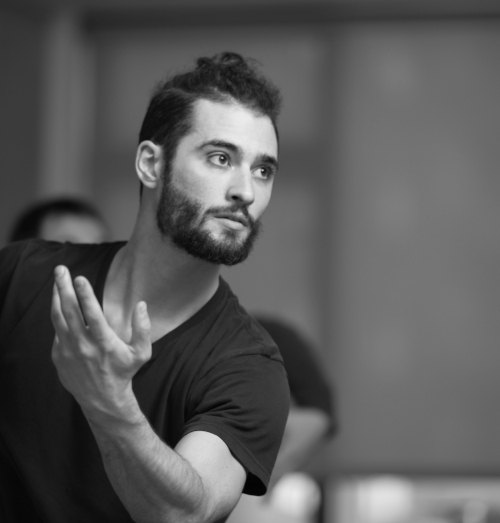 Antonio has performed with the Martha Graham Dance Company and Graham II, Erick Hawkins Dance Company, Kosovo Ballet, Staten Island Ballet, Boca Ballet Theatre, Mare Nostrum Elements, and Michael Mao Dance, with whom he has performed as principal dancer since 2011. In 2011, he created Alto Jonio Dance Festival in Villapiana, Calabria to provide exceptional dancers in Italy the opportunity to perform with established companies in New York. In 2013, Antonio expanded his vision by founding the Italian International Dance Award, which recognizes phenomenal Italian and international dancers for their accomplishments. In 2014 Alto Jonio was transformed into Fini Dance Festival with the mission of establishing greater connections between dancers in New York and Italy. The festivals have been listed as one of the top summer dance festivals in the United States (Dance Informa) and Europe (Ballet 2000). Wake Forest Arts is supported by United Arts Council of Raleigh and Wake County and the North Carolina Arts Council, a division of the Department of Natural and Cultural Resources. newest members of Koffee Dance Company. Danielle started dancing at age three with the Dance Etcetera Youth Ensemble, and joined the company at age 7 and has competed with the company for over 10 years. She has trained in jazz, tap, ballet, pointe, hip-hop and contemporary, and has competed in DanceMakers, Inc. StarQuest, Encore and Show Stoppers circuits. Danielle is a former dance instructor for South West Georgia Performing Arts Dance Academy, where she choreographed dances for the junior company competition teams (ages 7-13), and presently teaches at Yvette’s Dance Academy in Fayetteville NC. DON'T MISS THIS OPPORTUNITY to study with the company member and Rehearsal Director of the world renowned José Limón Dance Company! 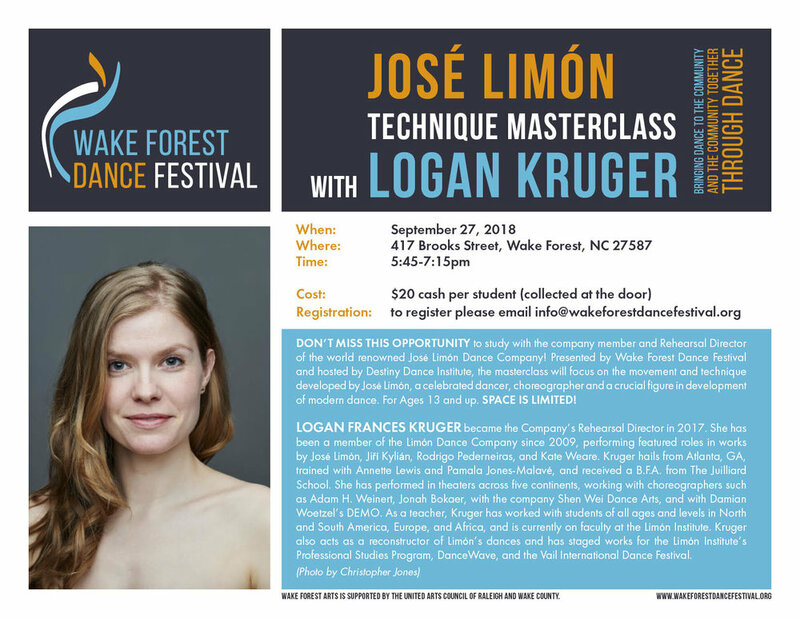 Presented by Wake Forest Dance Festival and hosted by Destiny Dance Institute, the masterclass will focus on the movement and technique developed by José Limón, a celebrated dancer, choreographer and a crucial figure in development of modern dance. LOGAN FRANCES KRUGER became the Company’s Rehearsal Director in 2017. She has been a member of the Limón Dance Company since 2009, performing featured roles in works by José Limón, Jiří Kylián, Rodrigo Pederneiras, and Kate Weare. Kruger hails from Atlanta, GA, trained with Annette Lewis and Pamala Jones-Malavé, and received a B.F.A. from The Juilliard School. She has performed in theaters across five continents, working with choreographers such as Adam H. Weinert, Jonah Bokaer, with the company Shen Wei Dance Arts, and with Damian Woetzel’s DEMO. As a teacher, Kruger has worked with students of all ages and levels in North and South America, Europe, and Africa, and is currently on faculty at the Limón Institute. Kruger also acts as a reconstructor of Limón’s dances and has staged works for the Limón Institute’s Professional Studies Program, DanceWave, and the Vail International Dance Festival. Isabelle Frame originally began her dance studies at Beckley Dance Theatre in West Virginia. 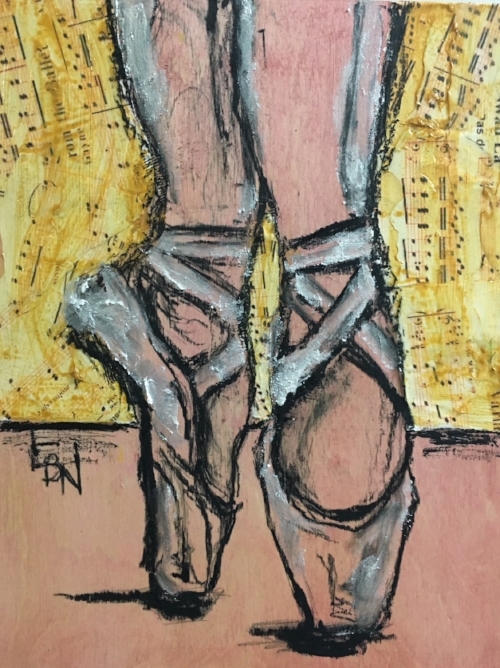 She continued her training in Durham, North Carolina with the Durham School for Ballet and the Performing Arts under the direction of the Boleyn Willis-Zeger where she started in countless storybook ballets. Isabelle was also excepted to attend summer training programs at the procedures American Ballet Theatre and Ballet Arizona. She has performed as the corps de ballet with Charlotte Ballet Company and received leading roles with the Charlotte Ballet Academy. Her favorite ballet roles include Polly and Pineapple Poll, Wendy in Peter Pan, and the title role in Cinderella and a Little Mermaid. She also has studied and performed a variety of contemporary repertory rooted in the research Shaga and the Gaga Movement Language as well as William Forsythe’s Improvisation Technologies Unser the direction of ShaLeigh Comerford, Artistic Director of ShaLeigh Dance Works, where she is currently a company member.